Welcome to Shipwright Pointe located in the beautiful town of Swansboro! 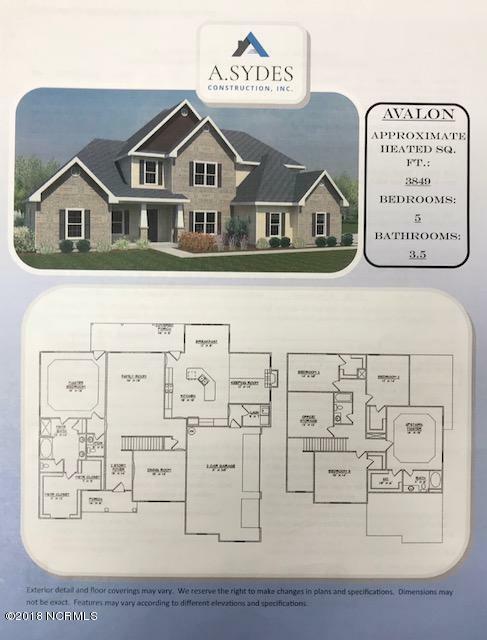 Shipwright Pointe welcomes Sydes Construction and the Avalon floor plan. This 5 bedroom, 3.5 bathroom masterpiece has a tremendous amount of space, including formal dining room, one of two master bedrooms on the first floor and a cozy keeping room with a fireplace just off of the kitchen. The exterior of the home is quite charming with landscaping including sod in the front yard. The foyer makes a great impression upon entering the home. As you enter, you will discover the formal dining room making this the perfect room for entertaining and enjoyingcompany. The kitchen is equipped with stainless steel appliances such as smooth-top range, microwave hood and dishwasher. Also included are beautiful counter tops, an island with a stainless steel sink and single lever pull out chrome faucet. This home features a very spacious family room, large back patio and best of all, one of two Master Suites on the first floor! This perk is hard to find! Both master suites feature a decorative trey ceiling, huge walk-in closet, ceiling fan, and is connected to the master bathroom. This bathroom has a tub and a separate walk-in shower! Upstairs features 3 bedrooms, one of them being a second Master Bedroom. All rooms feature walk-in closets and are pre-wired for cable, as well as ceiling fans. A 2 car garage completes this beautiful, one-of-a-kind home! Located in the heart of Swansboro within a short distance to the beautiful and world-renowned Hammocks Beach State Park. Close to shopping, bases, dining and of course the beach! You cannot go wrong with this home in this ideal location. Proximity to schools and a peaceful community add to the charm of this area. There is still time to personalize this dream home. Call today to make your selections. Note: Floor plan renderings are similar and solely representational. Measurements, elevations, design features, among other things, may vary in the final construction. Call to verify. Photos are of similar homes and actual new photos of the home will be taken as construction progresses.